1. Go through magazines very quickly pulling out pictures that make your heart sing. This is an intuitive process, so quickly is important. No thinking or analyzing. Pull out the picture if you love it! 2. Put them together on a large circle cut out of cardboard or tag board. I like to use the circle format because circles represent wholeness and healing. Use a glue stick to adhere them to the circle. What is in the middle that represents the center of your vision, where you are now or who you are? 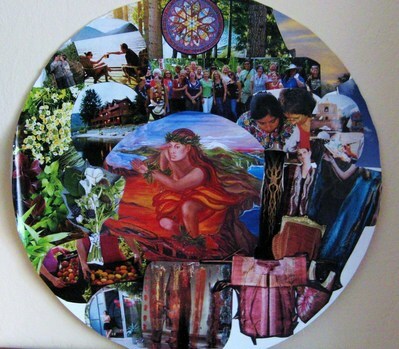 The next part, after you make the collage, is often a moving experience in my Playshops as each woman shares their experience and what they saw as they dialogued with their images. What did you learn about your Inner Beauty?